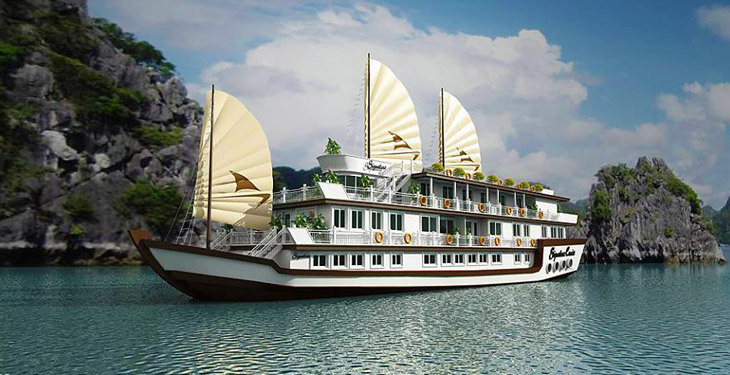 Cruising through the emerald waters and past the towering limestone islands of Ha Long Bay is a stunning experience. Experience a comprehensive ten-day guided tour through the highlights of both northern and southern Vietnam. 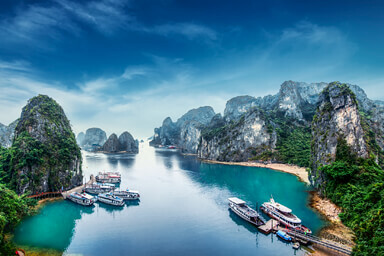 This trip for two starts in the cosmopolitan city of Hanoi, with its lively juxtaposition of old and new, then take a boat down the Red River to Ha Long and Lan Ha Bays for three days of cruising through the azure blue seas and striking limestone islands. 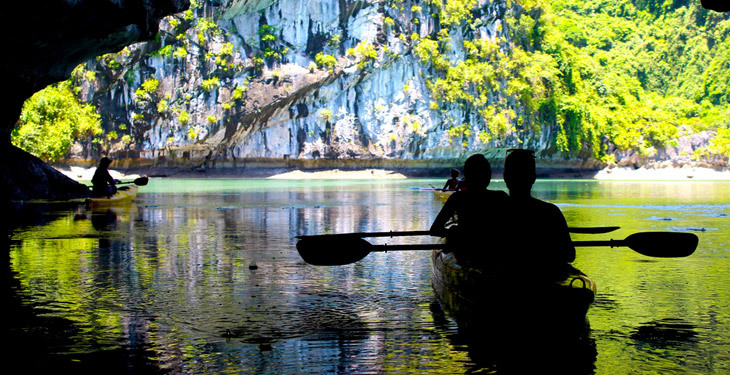 Craft your adventure as you wish, with plentiful opportunities to kayak along hidden coves, swim and relax on white-sand beaches, hike to island tops for panoramic views, fish for elusive squid, and sip on cold drinks on the open sundeck. After breakfast, enjoy a day tour of Hanoi, the capital of the Socialist Republic of Vietnam, located on the banks of the Red River with Hoan Kiem Lake at its center. An English-speaking guide will take you around the city to many of the city’s major attractions. You'll have the opportunity to travel north to the Old Quarter, an old trading and manufacturing district whose bustling streets are each named for the trades that were practiced there. 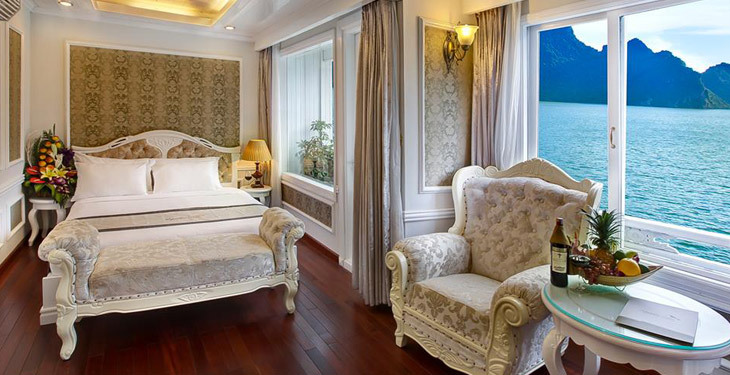 Wake to the beautiful views of Ha Long Bay and choose from a variety of breakfast items at the buffet. If you are an early riser, you may also opt to enjoy a Tai Chi class on the upper deck as the sun rises. After breakfast, board the day boat to the Cong Dam area, best know for its crystal-clear waters and sandy beaches. Spend the day kayaking, swimming, or relaxing on a stunning and secluded beach. Later in the afternoon, head back to the main vessel to travel towards the next overnight location while enjoying happy hour, another cooking demonstration, and a brilliant sunset. This evening you can choose how you want to socialize, with options to attend a movie night, play board games, or share stories over a drink at the bar. 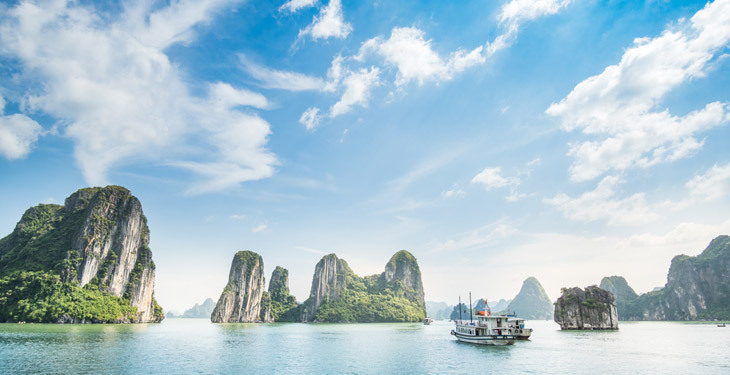 This morning will be your last chance to observe Ha Long Bay in all its glory. Choose to wake for the sunrise with coffee or tea, or maybe another Tai Chi session to feel connected with the peaceful surroundings. After enjoying a light breakfast, cruise along the Thien Canh Son Cave and islets, viewing this wild and mysterious location. 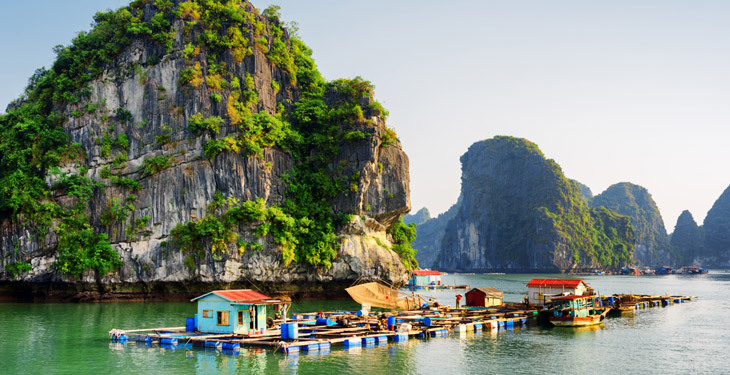 Check out of the cabin and enjoy brunch as the boat makes it's last leg of the journey back to Ha Long City, then transfer back to Hanoi. We were a group of four Australians in our late 50’s and we truly loved this holiday. This tour was different from many as it was like a self-planned holiday with activities programmed throughout the time. We were not with one group of people traveling through Vietnam and had lots of time to do our own thing. There was nothing about the tour we did not like. The communication was great, activities planned fantastic, hotel really good with wonderful breakfasts and the variety of things suited us beautifully. We had good hotels, a great night on a boat in Ha Long Bay, an overnight train, sampan rides, kayaking and bike riding--it was action packed. 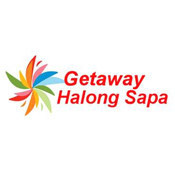 Thank you on behalf of our group, we would not hesitate to book with Getaway Halong Sapa again. Voucher valid till April 30, 2020. Please see FAQs for high season surcharges and blackout dates. Please do not make travel arrangements until you have received confirmation from Getaway Halong Sapa. To redeem your voucher, simply reach out to the operator as instructed in your confirmation email, and be sure to provide your order number. Voucher is valid until April 30, 2020. - $90 per person surcharge from April 25 to May 5, 2019; August 28 to September 5, 2019; December 24 to December 31, 2019; Jan 1 to Jan 23, 2020 and Jan 30 to Feb 29, 2020. - $60 per person surcharge from March 1 to April 24, 2019; October 1 to December 24, 2019; and March 1 to April 24, 2020. - $55 per person surcharge for the Gala Dinner on the cruise portion of the tour on December 24 and December 31, 2019. - Black out date from Jan 23 to 29, 2020 for Lunar New Year in Vietnam.